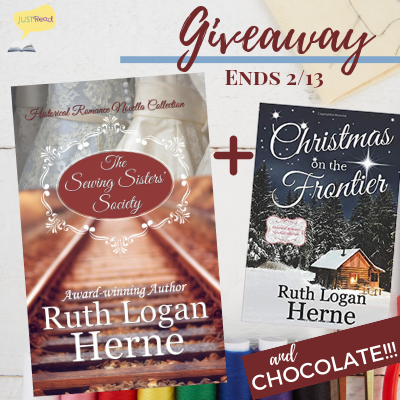 Welcome to the Blog Blitz & Giveaway for The Sewing Sisters' Society, a collection of historical novellas by Ruth Logan Herne, hosted by JustRead Publicity Tours! 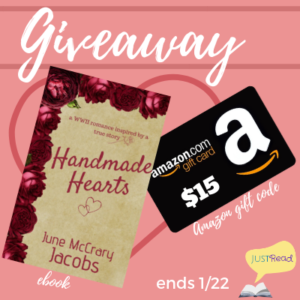 Macy can’t sew a lick, and she’s come to town with a sacrifice and a secret, but when Hattie’s first apprentice is attracted to the pastor of the only church in town—the man raising her illegitimate son— will the truth set her free? Or make her leave the town and her son behind? 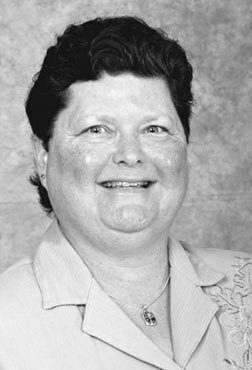 Unjustly accused, Nellie comes west to escape the law. She has a way with tucks and gathers, and every Western town could use more tucks and gathers. She’s determined to improve the drab look of the prairie and manages to brighten hearts as well. But will her quick speech and firm ideas of women’s suffrage draw Levi Eichas closer or send the somber carriage maker running? Grief has robbed Ann Hazel, but when her aunt pushes her to go west and help an ailing Hattie McGillicuddy turn hems, Ann’s shamed into it. She’s managed to avoid life for awhile, but when Sol Eichas’s nanny comes down sick, Ann reluctantly agrees to help. As she winds her way around Sol’s heart and home, can the two troubled souls leave the past behind to embrace a future together? 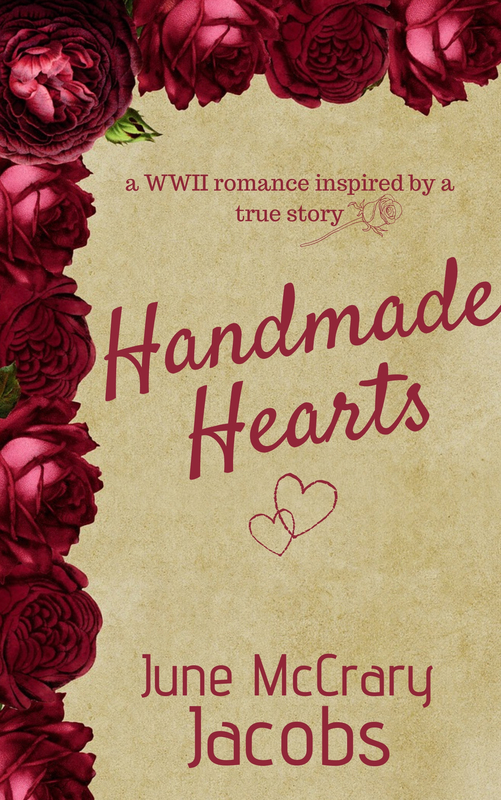 A Most Inconvenient Love - Ruthy's first full-length historical novel! 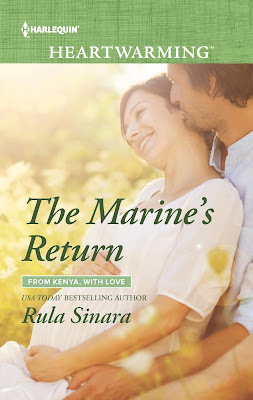 Thank you for joining me in celebrating the release of THE MARINE’S RETURN, the sixth and final book in my ‘From Kenya, With Love’ series for Harlequin Heartwarming. No words can express how much I have loved writing this series, from watching the children in the first three books grow up to face their own romantic hurdles in books 4 through 6, to endearing orphaned baby elephants and other captivating wildlife, to the famous, breathtaking setting of Kenya’s Serengeti ecosystem and Masai Mara regions. The stories in this series take on issues such as ivory poachers, loss of loved ones, selective mutism, fracking and other environmental issues, human rights and those of a country’s indigenous people, man vs nature conflicts, education for young girls/women who have little access, medical care in rural populations and the life-changing challenges our war veterans face, from PTSD to physical injuries. The books do stand alone, although readers who have been following the series have said that, since it has a rich family saga/miniseries feel and characters from the first books play significant roles in the later stories, reading them all makes for a deeper experience. 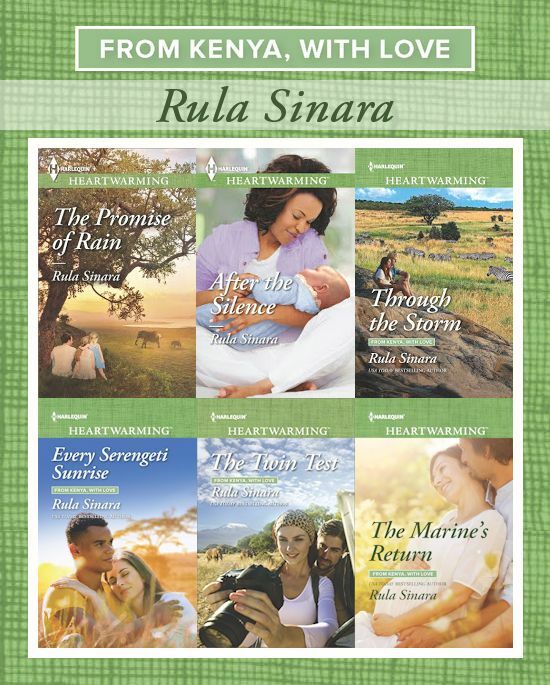 For example, Pippa Harper, who everyone meets as a spunky, adorable four-year old being raised at a remote, rustic elephant rescue camp in the Serengeti by her single-mom wildlife vet in book 1 (THE PROMISE OF RAIN), is a young adult in book 4 (EVERY SERENGETI SUNRISE), gets her own romance in book 5 (THE TWIN TEST) and even plays a role as the series comes to a close in book 6 (THE MARINE’S RETURN). We also see Haki, a childhood friend of Pippa’s in book 1, and Maddie, a ten-year-old who can’t speak in books 2 (AFTER THE SILENCE), get their hero/heroine stories in EVERY SERENGETI SUNRISE. Mac Walker, a rugged bush-pilot with an Indiana Jones air to him is seen throughout the series and gets his own adventure in THROUGH THE STORM. 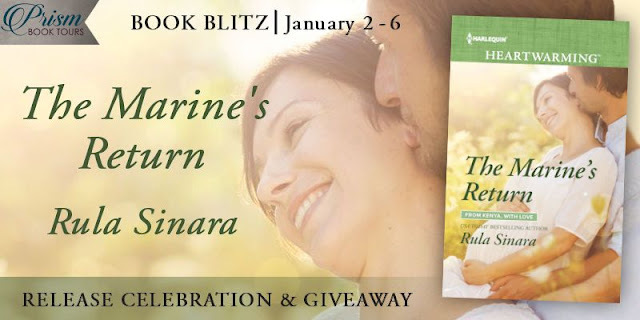 And we first meet the hero of THE MARINE’S RETURN, Chad Corallis, as a rambunctious, hyperactive and very cute toddler who is clearly destined to follow in his father’s footsteps and become a marine (book 2). He does just that, but his future ends up coming to a dark stop and he’s faced with a challenge he’s convinced he can’t overcome. But, despite the seemingly impossible romantic obstacles, heart-gripping situations and, even, danger in the books, there’s always the promise of a happily ever after in a Harlequin Heartwarming romance. I hope you enjoy the series and this final story! Be sure to also check out my novella (which is linked to this series), THE SWEETHEART TREE, in the anthology A Heartwarming Thanksgiving. Although my ‘From Kenya, With Love’ series is coming to a close, I’m embarking on a new series for Harlequin Heartwarming that will take you from rescuing elephants in Africa to saving sea turtles along the Outer Banks of North Carolina. My ‘Turtleback Beach’ series is set in a fictional beach town along the more southern Hatteras Island of the Outer Banks and the first book, ALMOST A BRIDE, which involves a runaway bride and an ex-military hero in the witness protection program, releases June 1, 2019. Many thanks to all of my readers. I wish everyone a peaceful and happy New Year! 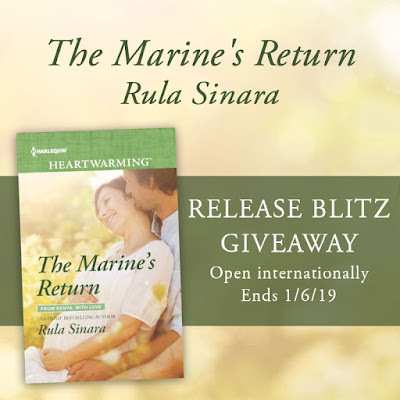 National and USA Today Bestselling author Rula Sinara lives in rural Virginia with her family and crazy but endearing pets. She loves organic gardening, attracting wildlife to her yard, planting trees, raising backyard chickens and drinking more coffee than she'll ever admit to. 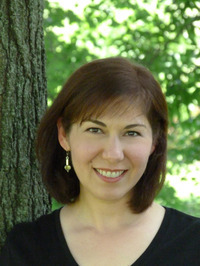 Rula's writing has earned her a National Readers Choice Award and HOLT Medallion Award of Merit, among other honors. 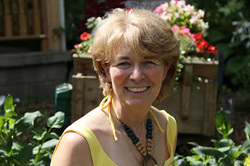 You can discover more about Rula at her blog A Writer’s Rush, on Twitter, on Facebook as RulaSinaraAuthor or on her website www.RulaSinara.com, where you can also sign up for her newsletter. - Autographed print copies of the first three books of the ‘From Kenya, With Love’ series – The Promise of Rain (Mills & Boon Duo copy, including The Weather Girl by Amy Vastine), After the Silence and Through the Storm. - A 15x15 canvas tote bag featuring the cover of Through the Storm.